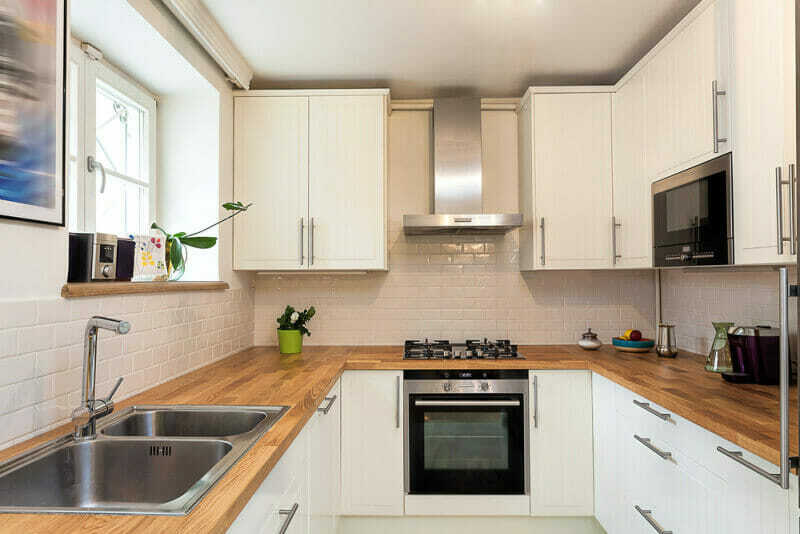 Whether it's for your new kitchen or you will be painting old kitchen cabinets white. 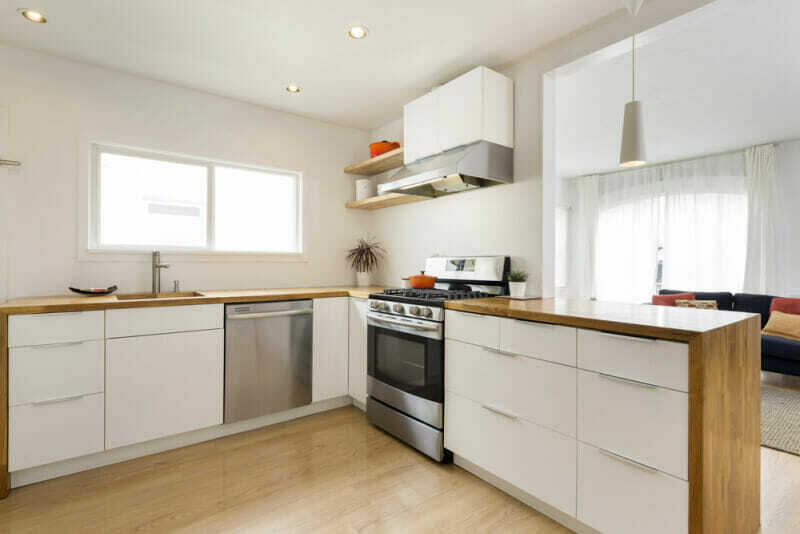 Enjoy this gallery of white kitchen cabinets and design ideas. 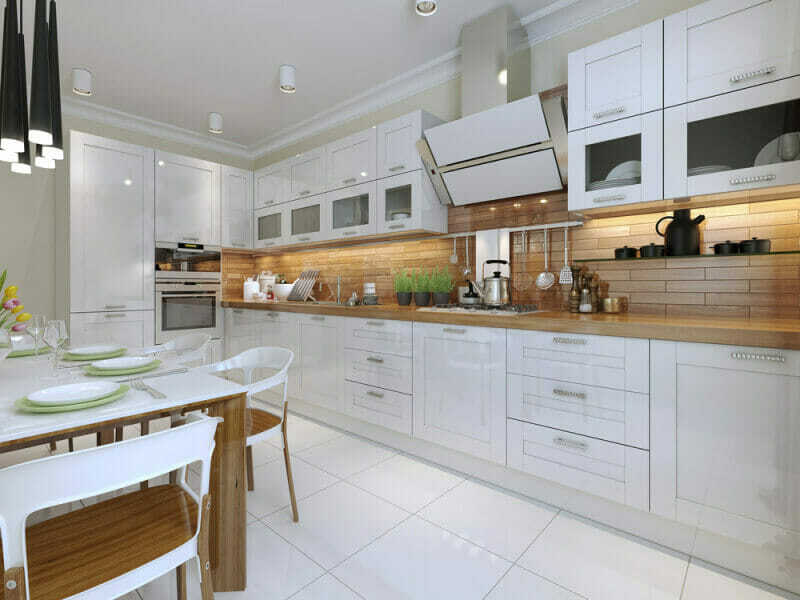 White kitchens are an interior design preference that is far from a trend. 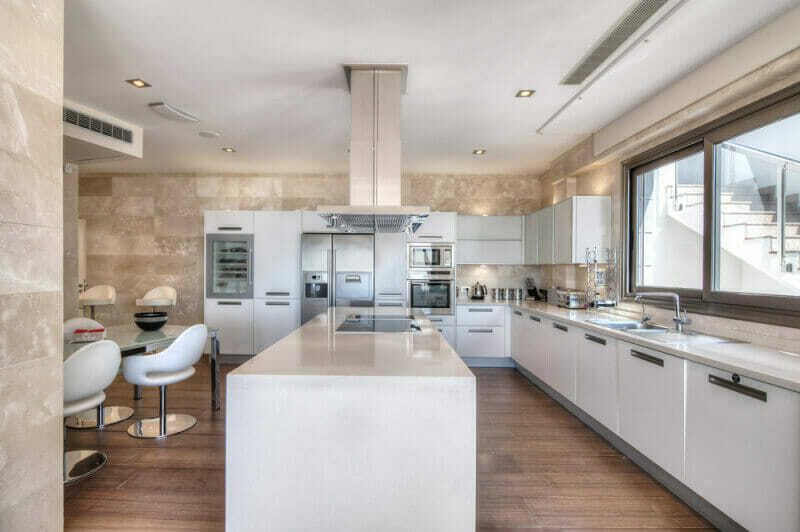 Regardless of trends throughout the years, the concept of a white kitchen has always remained. Part of this staying power is likely due to the unlimited colors and styles that look beautiful in white. 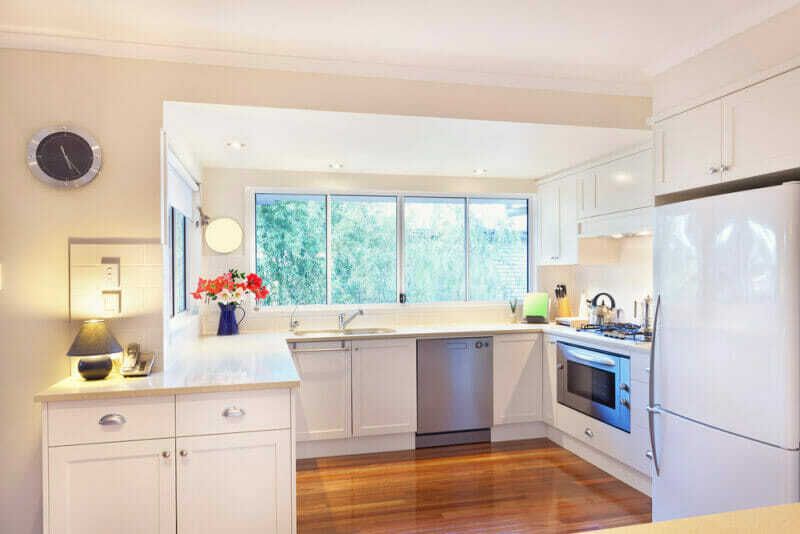 Another is that a white kitchen seems to convey a sense of purity. 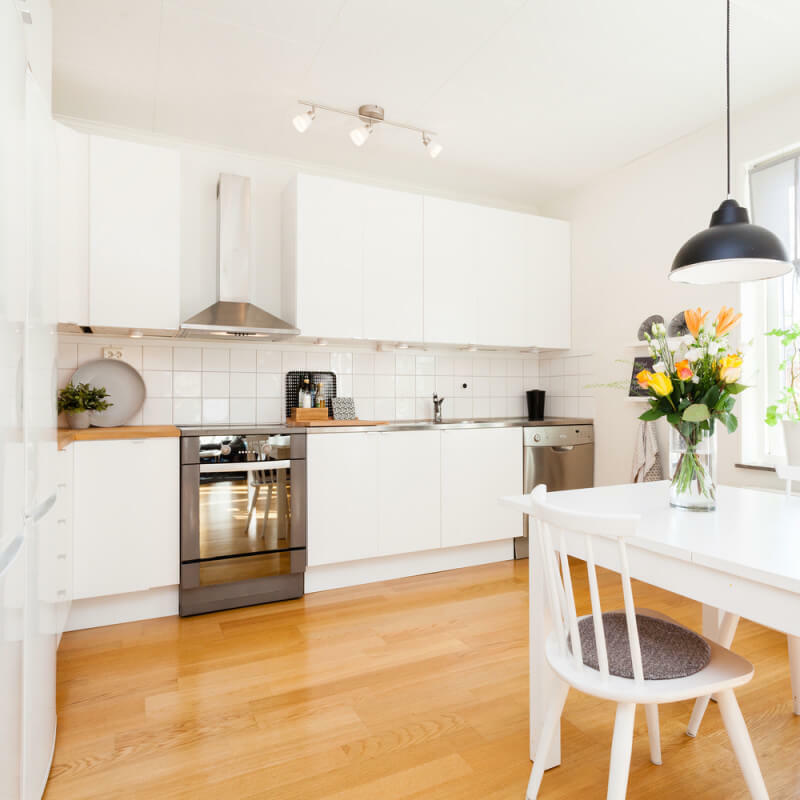 White is often associated with cleanliness and most people shouldn’t be able to argue against the benefits of a clean kitchen. White also creates an open and airy feeling in any space, regardless of size. 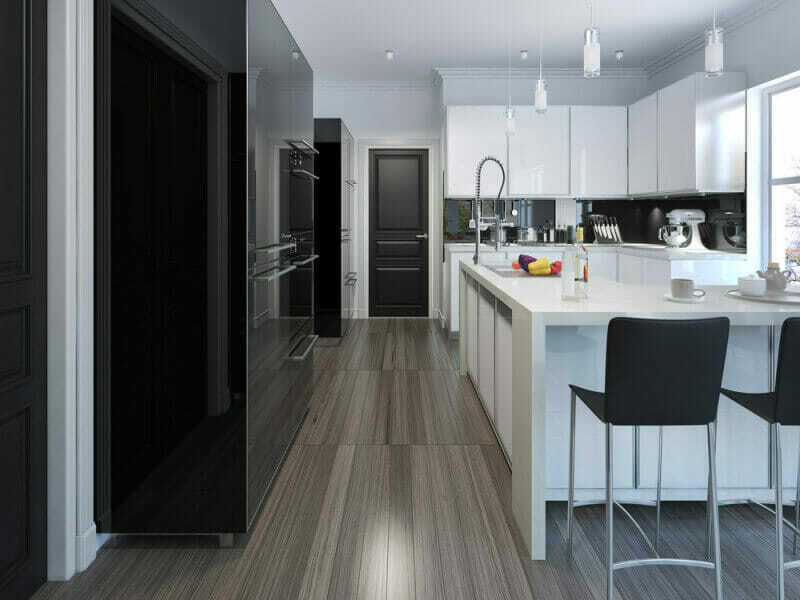 It is ideal for small galley kitchens and large, open concept spaces alike because it reduces the appearance of a rooms physical perimeter. 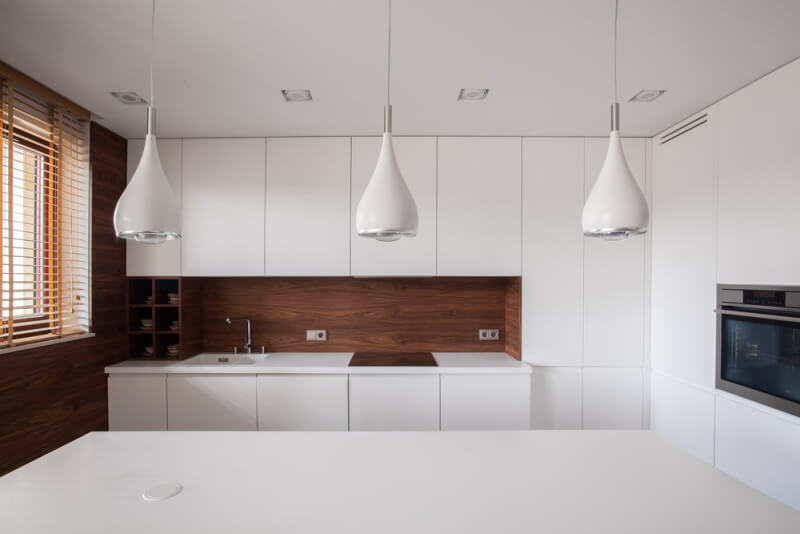 White also reflects light extremely well, therefore maximizing the amount of natural and artificial light available in a space. White is like the perfect pair of jeans, it goes with anything. 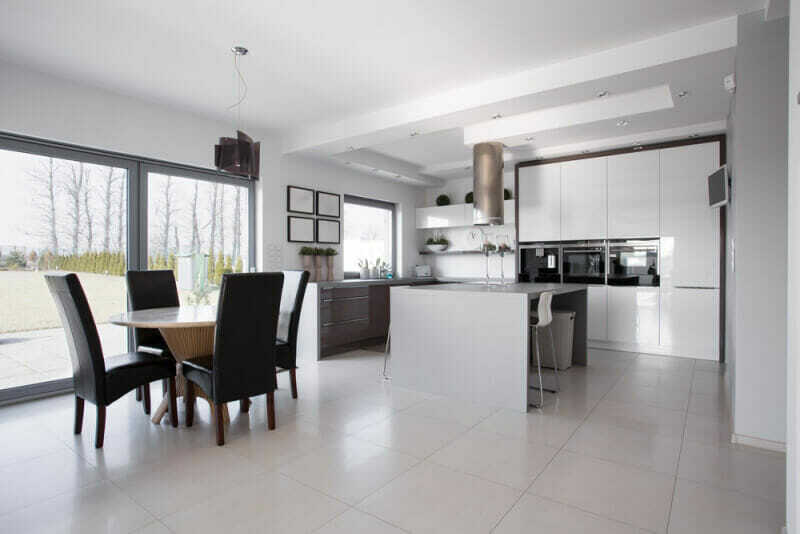 Homeowners can feel free to mix in a variety of colors, patterns and styles in a space that is primarily white. 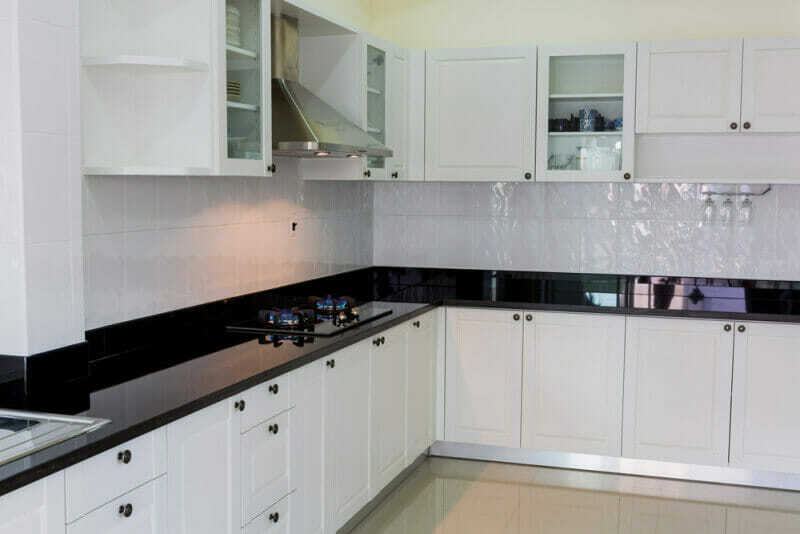 In addition, when replacing expensive items such as countertops and flooring, you can feel confident that your white cabinets will coordinate nicely. Obviously, this doesn’t apply in every situation, but it is most often the case. 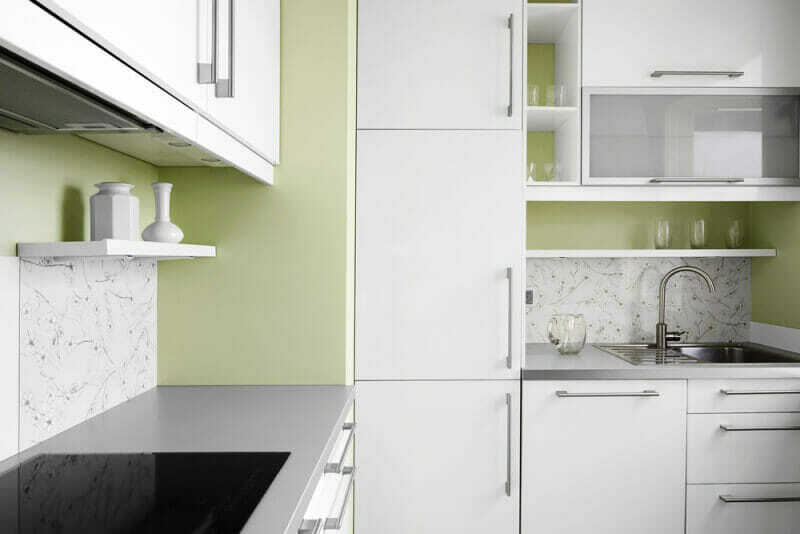 White cabinets also look great with stainless steel and white appliances. 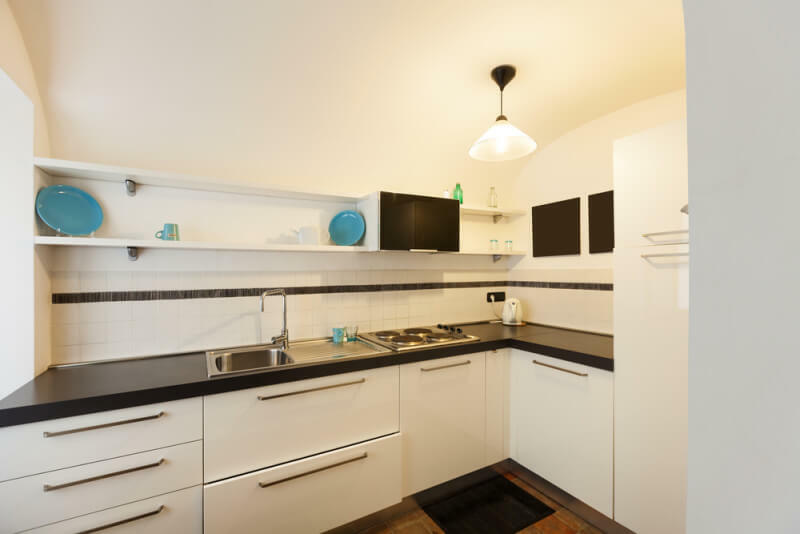 Black appliances are a possibility as well, in most kitchens. 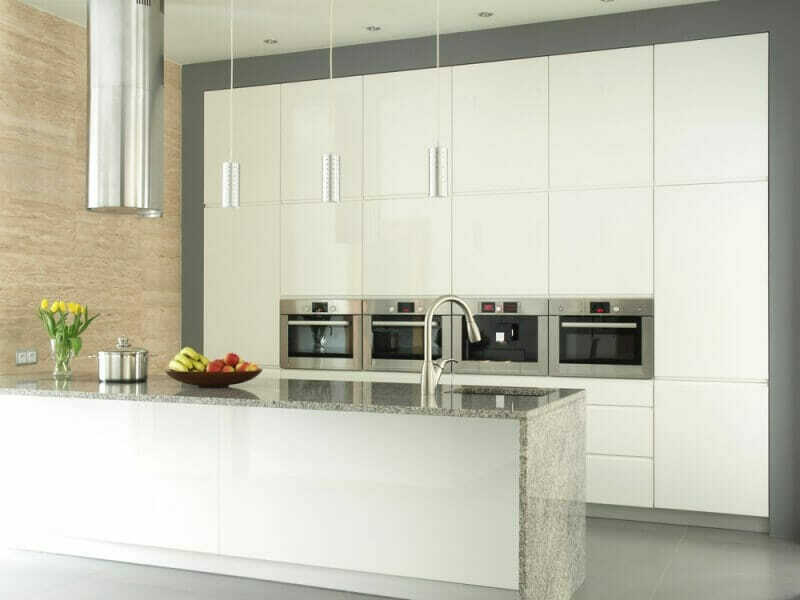 When considering installing a new white kitchen you can feel confident that it will stand the test of time. 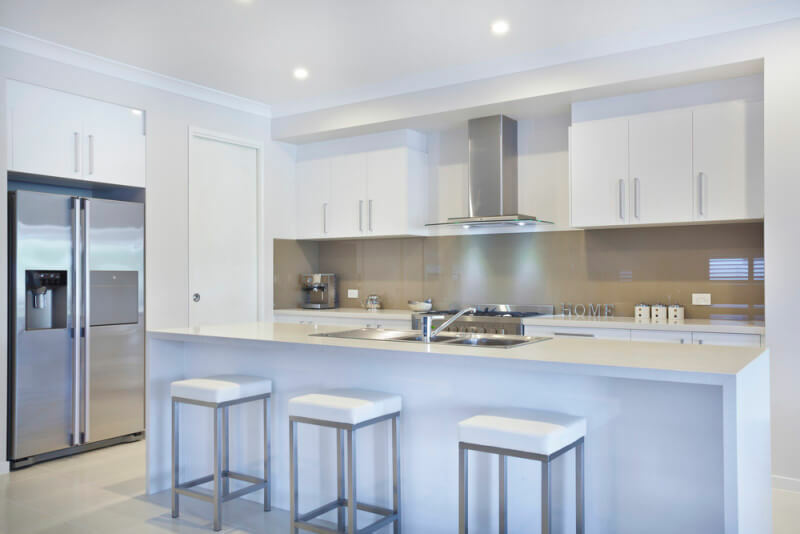 Homeowners should take time and care to consider the finishes and kitchen layout prior to installation. Making trendy design choices will age your kitchen more quickly. 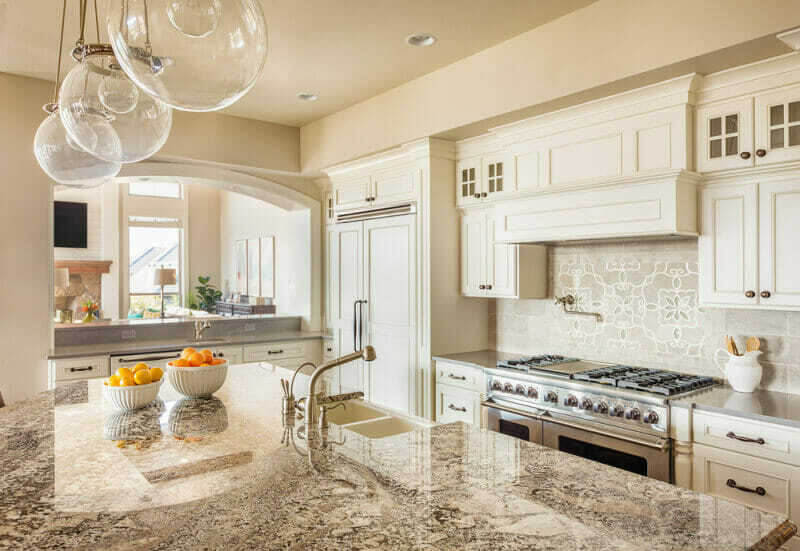 But, for example, a white kitchen with stainless steel appliances and marble countertops will look elegant and on-point for many years to come. 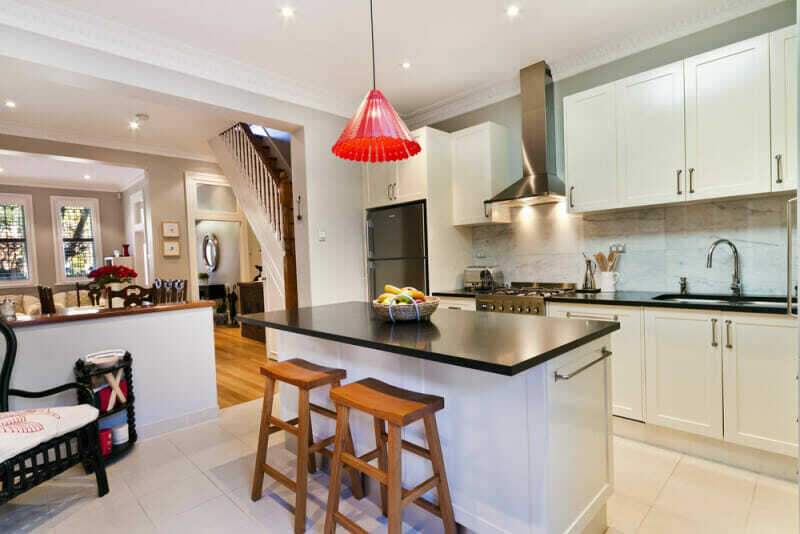 Consult the services of a kitchen contractor and interior designer when preparing a large kitchen remodeling project. Opting out of upper cabinets creates extra room for large, expansive windows to let in lots of natural light. 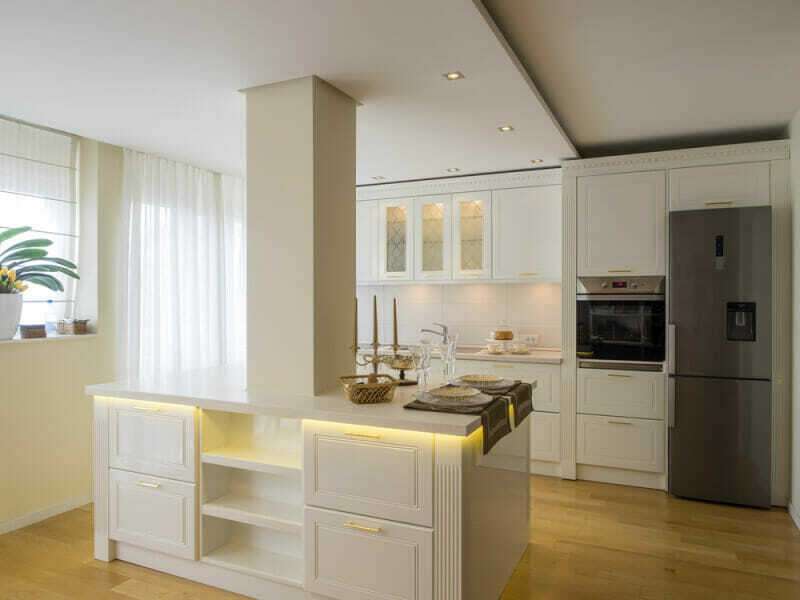 Sleek, white cabinets in a galley kitchen create the illusion of more space. 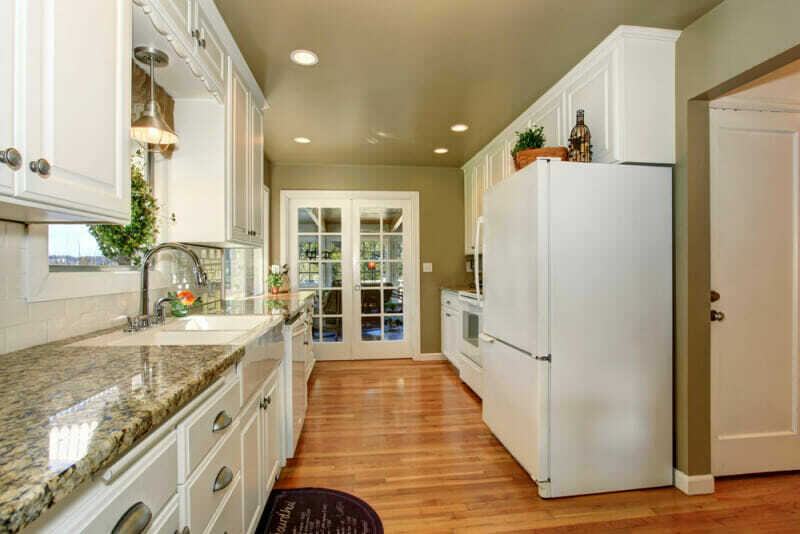 The neat, wrap-around, countertop in this space provides maximum space for all kitchen activities. 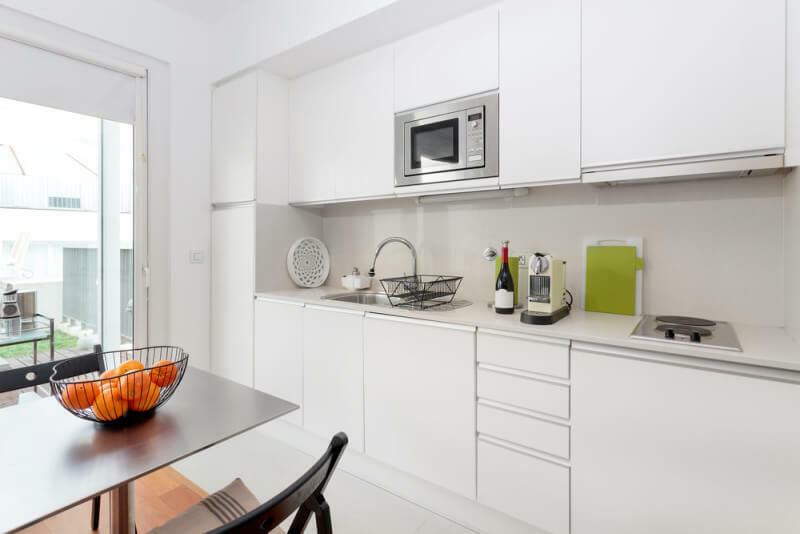 Additional floor space is created in this kitchen by installing the fridge and upper cabinets into a niche in the wall. 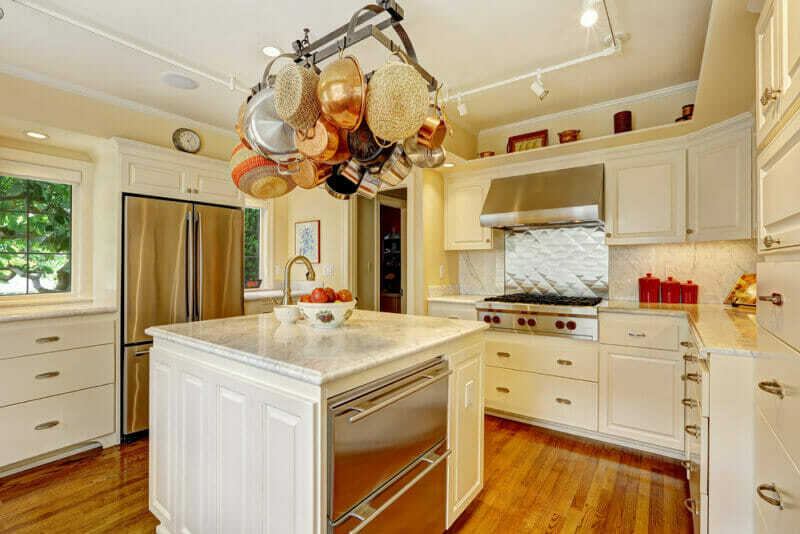 This kitchen maximizes available ceiling height by installing an entire wall of cabinets and appliances. 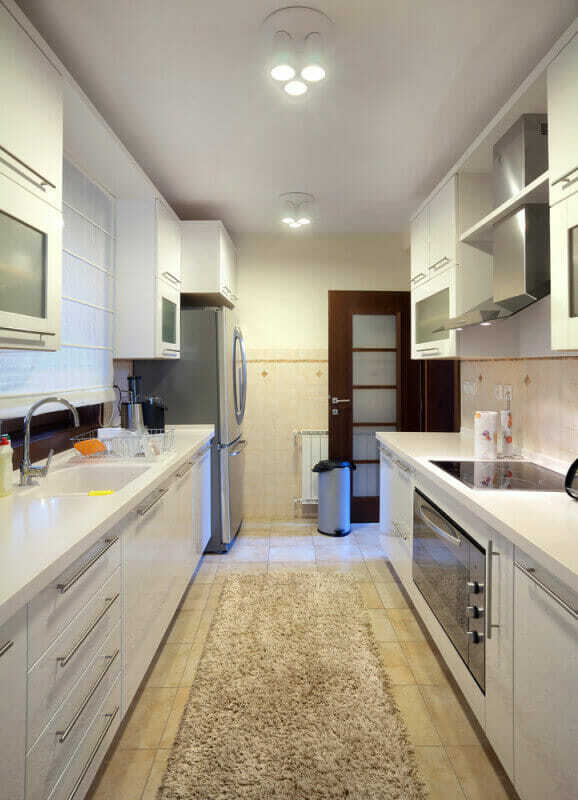 Store the majority of your small appliances inside the kitchen cabinetry to allow for more usable counter space. The white cabinets, subway tile and butcher block counter top provide light and bright in this u-shaped kitchen. This small kitchen optimizes available storage space by using drawers in the lower cabinets, rather than shelving. The shiny, black countertop in this all-white kitchen helps to anchor the eye and create a natural focal point. The black pendant lights and darker appliances and accessories contrast perfectly in this kitchen. The wrap-around stone island provides an expansive space for food prep and a place to visit and talk. The red, white and cream color palette of this traditional kitchen coordinates beautifully with its warm, wood floors. 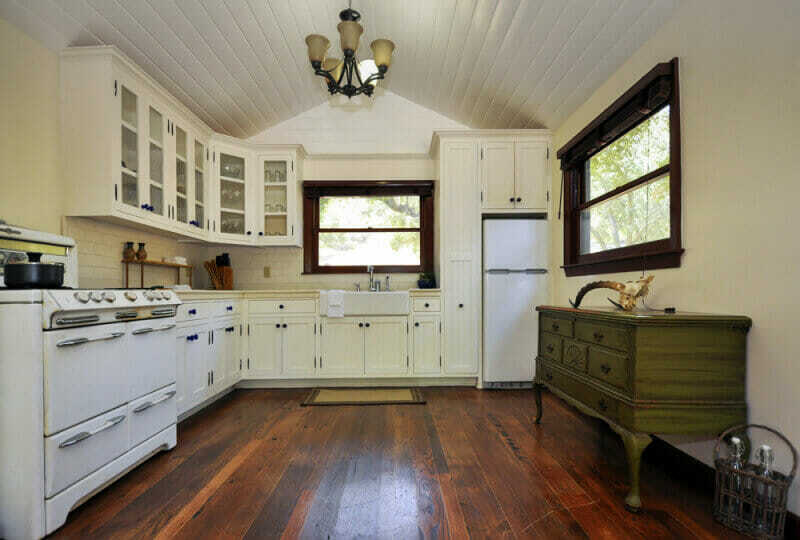 The warm-white cabinets and worn, wood floors creating an inviting environment in this classic, country kitchen. The pistachio-green wall color in this cozy kitchen adds a little fun to this cozy space. 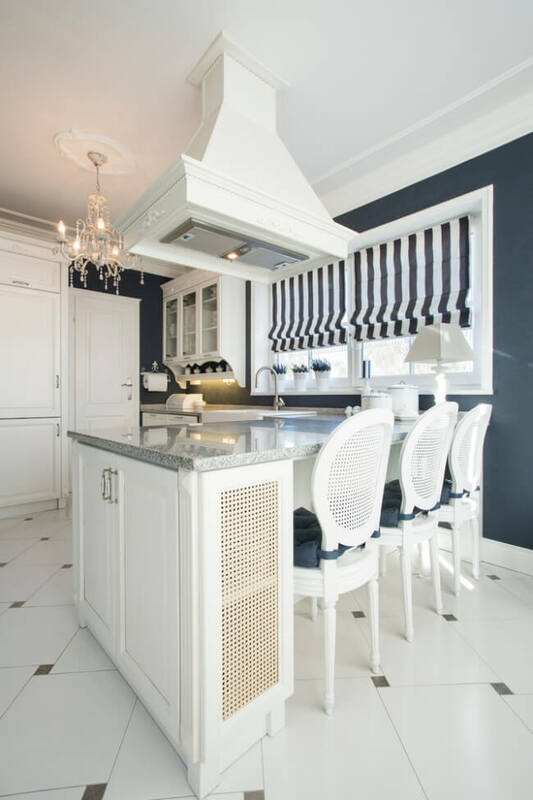 Navy blue is a perfect accent color for a white kitchen. Gold drawer pulls and door handles add an elegant touch to paneled, white cabinets. The large, beautiful island in this kitchen coordinates beautifully with its monochromatic color scheme. Subway tiles come in a variety of colors, not just white. The dark gray tiles above the stove create a beautiful focal point for this white kitchen. The modern cabinets and chrome accents in this space are an unexpected touch in this otherwise traditional space. 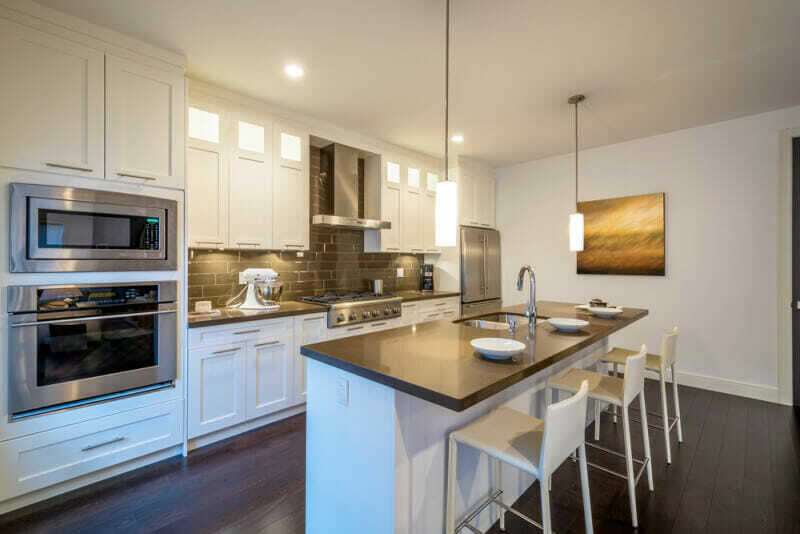 The wraparound, wood countertop on the lower cabinets frames them beautifully and adds warmth to the space. 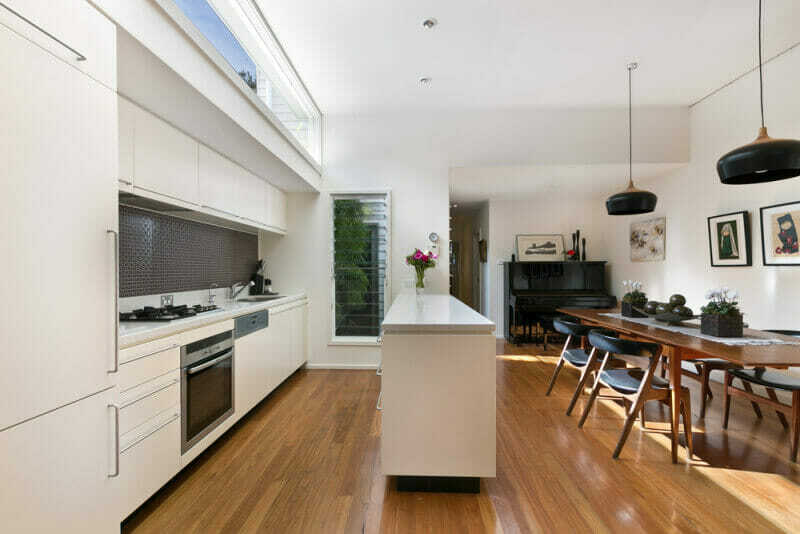 With lots of natural light and shiny, reflective surfaces this modern kitchen offers an elegant place to cook and visit with friends. Warm woods always warm up an all-white space. This open concept kitchen is a light and airy space with open shelving and a place to display wall art. 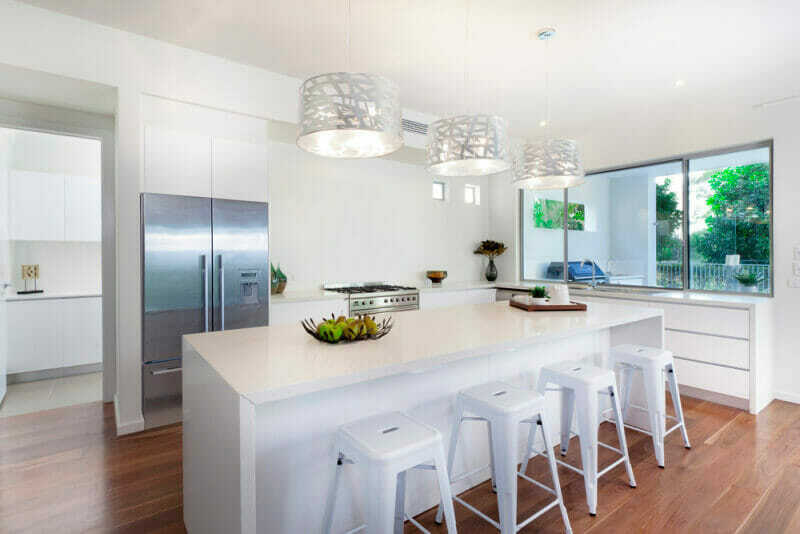 An all-white kitchen is creates the illusion of a much larger space. Glass-front uppers provide an opportunity to display beautiful china and dishware. 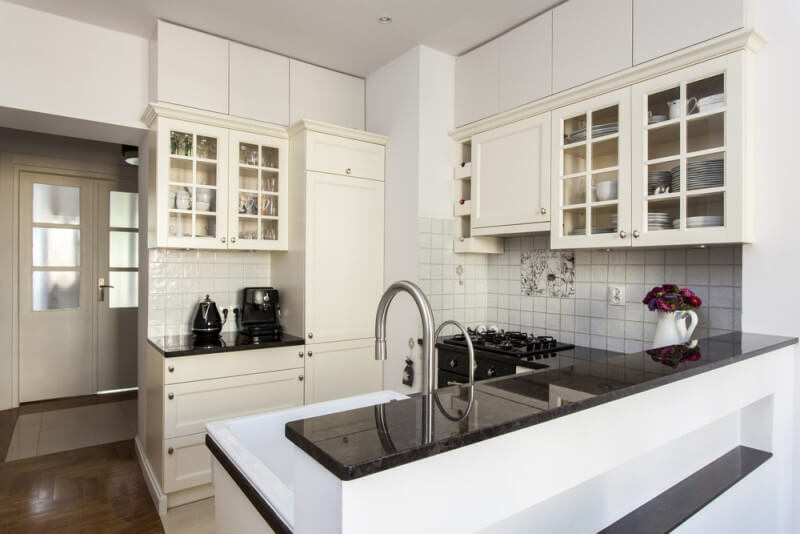 If there is enough room, a long row of lower cabinets can provide plenty of storage space for everything from kitchen appliances to dishes and cutlery. The sage-green wall color in this country kitchen coordinates perfectly with granite countertops. 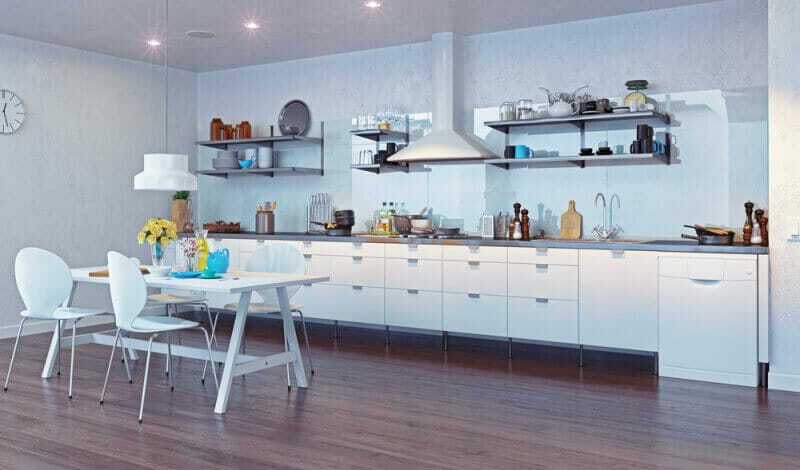 Modern cabinetry and mid-century modern furniture are a great combination for this open space. 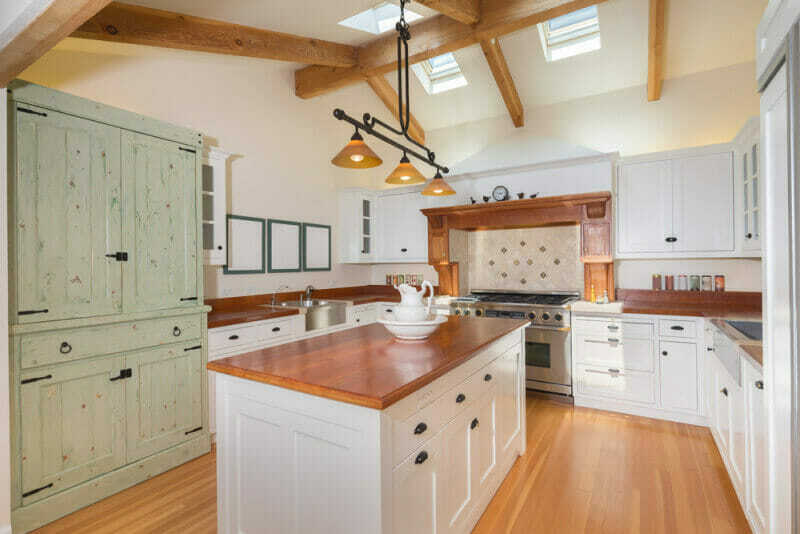 The large, country kitchen combines a variety of cabinet colors and treatments to create a truly unique space. The brightly-colored pendant light creates a pop of color against the white cabinetry in this space. 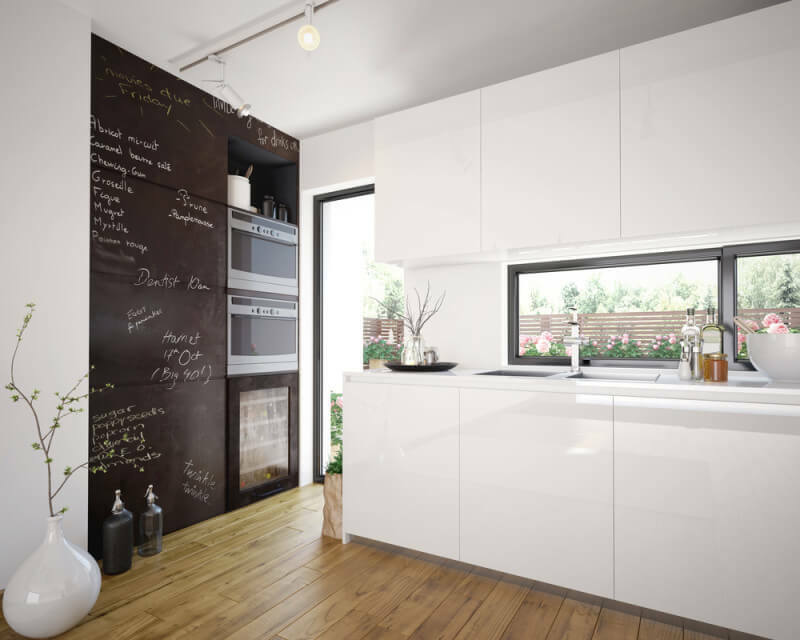 If space allows, a large chalkboard wall is a great addition to any kitchen because it gives lots of space for grocery lists and a place to record messages.